Unless you’re living on the rock, you’ve noticed a World Cup is just kicking off in South America. The world’s fifth-largest country and arguably the most soccer-rabid nation on the planet, Brazil, is hosting the 2014 World Cup. But how does it all work? The actual structure and organization of the tournament can be a bit confusing to the first-time soccer fan, as a few elements vary significantly from the major North American sports standards. 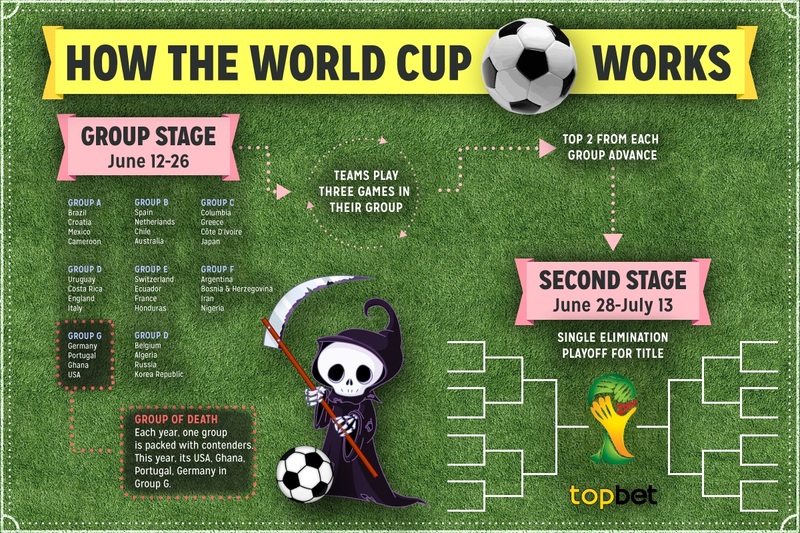 With that in mind, read on for our plain-worded take on how the World Cup works, take a look at our complete World Cup bracket predictions, check out our handy infographic below, and take a second to create a betting account that will get you all suited up to cash in on the most exciting tournament in the world. Maybe the most misunderstood part of the World Cup is qualification. And that’s because, quite simply, almost every country on Earth has a competitive men’s soccer team – 207 participated in qualification for the 2014 tournament. 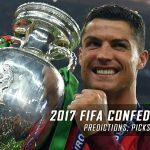 Many, many games are played all over the world to determine which teams will represent the six FIFA confederations (that is, the six governing bodies under the central organization that runs the World Cup, FIFA). The host team also qualifies automatically for every World Cup. Qualification is organized geographically, and through several rounds, teams are eliminated from each region until only the best remain. Take, for example, the qualification process for the Confederation of North, Central American and Caribbean Association Football, or CONCACAF region, which includes North America, Central America, and the Caribbean. 35 teams began qualification which consisted of several rounds of group play, with the poorest teams being removed after each round. 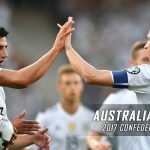 When it all shakes down, six teams are left playing in a round robin for the three spots CONCACAF contributes to the World Cup, with the fourth-placed team (in 2014: Mexico) winning in a play-in game with New Zealand for the final spot the two regions (CONCACAF and OFC) share to qualify. Bottom line? Every team, from every region, played and won many games just to get to Brazil. 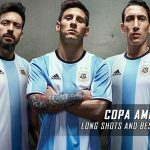 This explains why the tournament is called the World Cup Final – for the 32 teams that qualify, a great deal of sweat, tears, and effort has gone into just making the final dance. It is also why the quality of play tends to be so high at this tournament. Qualifying takes place in the years leading up to the final tournament (the last team to qualify for the 2014 World Cup, Uruguay, qualified more than six months before the tournament), and by the time things kick off in June, only the 32 left standing are on anyone’s mind. From this point on, things get cut throat. 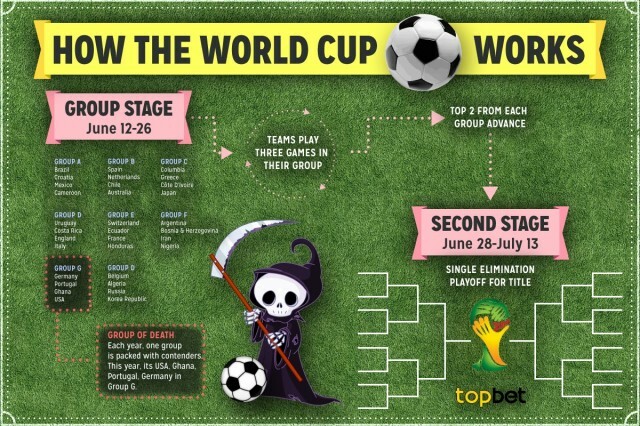 The World Cup Final begins with the Group Stage, in which the 32 teams are split into eight four-team groups using a ranking system that is designed to spread out the best teams in the field on the basis of the quality of their qualification campaigns. A team like Algeria, who would be thrilled to simply make the World Cup, will be hard-pressed to score a single goal in this stage, while a team like Brazil–packed with world-class players and having qualified easily–will have a relatively easy road through the Group Stage. Once split, it’s game on: teams play three games each in their group. 3 points are given for a win, 1 for a draw (there is no overtime in the group stage). If teams have the same amount of points after the group stage, the tie break is goals scored. The top two teams move on and the hopes and dreams of the bottom two teams are crushed – after such a long road, this is the end of the their World Cup. You can fulfill some dreams of your own by taking 30 seconds to complete our $500 World Cup prediction contest before getting back into our breakdown of how the World Cup works below. 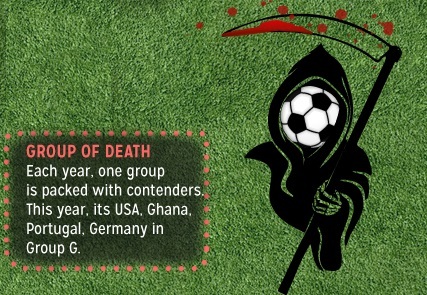 In 2014, the consensus Group of Death is Group G. 2010 semifinalists Germany, composed almost entirely of European superstars, headline the group, but all four teams have made it out of the group stages at recent World Cups. It will be a tough road for all four teams. For a complete breakdown and preview for Group G, check out our preview here. 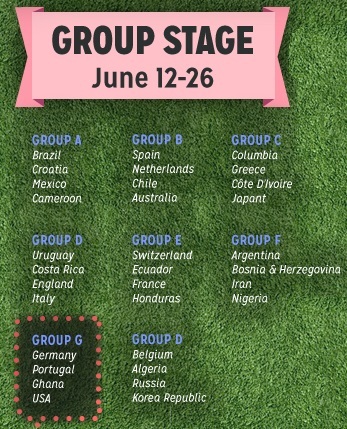 Despite all the talk of Group G, the 2014 tournament features what some are calling a second Group of Death, or the Other Group of Death. Group D is the first in World Cup history to feature three separate teams who have won the event in the past: England, Uruguay, and four-time winners Italy. 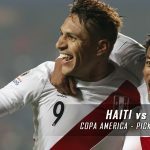 Though the fourth team in that region, Costa Rica, will also have a say in the proceedings, Group D will be focused on which of the three soccer powerhouses advances to the next round. 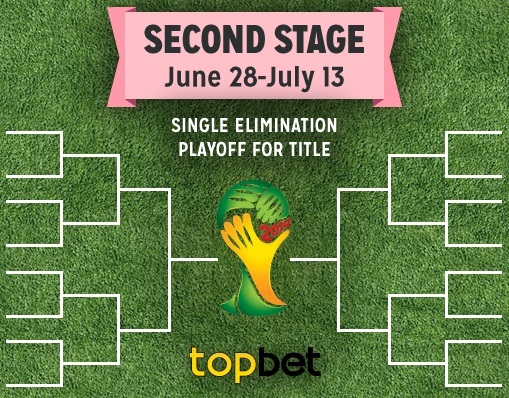 Speaking of which, if a team comes out in the top two in its group, its time to move on to a round known by various names: the second stage, knockout stage, or elimination stage. Call it what you will: these are the games that define World Cup history. Group winners and runners up are split into a bracket and from there teams single-elimination games. If the score is tied after the standard 90 minutes play down, 30 minutes of extra time is played. If after that the score is still tied, a winner is decided by the process that most soccer fanatics abhor: penalty kicks. The first games in this round are known as the Round of 16. Winners from that round move onto the quarterfinals, then semis, then the World Cup Final, which this year will be played on July 13. While this may be the most traditional part of the World Cup’s structure, it is also the most exciting. Seeing world soccer powers like Portugal, Spain, and Brazil play each other in consecutive games is the best-on-best quality that sports fans dream of. When the tournament is completed, and a champion is crowned, several marquee awards are handed out. The Golden Ball is given to the best player in the tournament, the Golden Boot goes to the player who has scored the most goals in the tournament, and the Golden Glove is awarded to the best goalie in the tournament. You can find our complete odds on these awards here. So there you have it. One of the best sports events in the world and we’re just getting started. Don’t forget to create a betting account to add that extra level of excitement (and profit!) to your World Cup experience, and enjoy the finest showing the beautiful game has to offer.